When anyone talks about investing, they say “Don’t work for money. Make money work for you”. And how does money work for you? It’s through compounding. What is it? Let’s start with a small story. There was once a poor poet who won the praise of the King. The King offered the poet to choose his reward. The poet, who knew his math very well, took a chessboard. He asked for a single grain of rice to be placed in the first square, double that in the second square, double that in the third and so on until the 64th square. Thinking it a simple offer, the King agreed. So the first square had 1 grain, the 2nd square had 2, the 3rd square had 4, the 4th square had 8. By the 10th square, the number was 512 grains. By the 20th square, it was 524,288. By the 64th square the number was 9,22,33,72,036,85,47,80,000. It’s not a number we can even put into words! That’s compounding for you. It happens when your first investment earns a return (the second grain in square 2), and this return in turn earns a return and so on over a period of time. Now look at it in the world of investments. Let’s say you invested Rs. 10,000 in a deposit which pays an interest rate of 10 per cent annually. You don’t opt for the payout of interest. In the first year, the interest earned is Rs. 1,000. You now have Rs. 11,000 (Rs. 10,000 + Rs. 1,000). This total amount will earn interest in the second year. That results in an interest of Rs. 1,100. What is happening is that the Rs. 1,000 that you earned in the first year is in turn earning Rs. 100 in the second year. So at the end of the second year, you have Rs. 12,100 in your hand. By the end of year 10, the Rs. 10,000 would have grown to Rs. 25,937. Mutual fund returns work in the same manner. Let’s say you invested Rs. 1 lakh in two mutual funds with NAVs of Rs. 10 and Rs. 250 respectively. A year later, both the funds’ NAVs rose by 10 per cent to Rs. 11 and Rs. 250. Your investment is now worth Rs. 1.1 lakh. At the end of the second year, both funds again saw their NAV rise by 10 per cent. Their NAVs now become Rs. 12.1 and Rs. 302.5. The value of your investment has thus grown to Rs. 1.21 lakh. 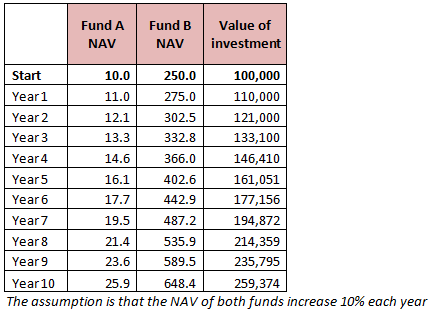 The table below shows how your investment value rises each year, assuming that the NAVs of both funds rise 10 per cent each year. As you may now notice, the longer you stay invested, the more your investment grows. The power of compounding is felt over a long period of time and not in a couple of years. This is why you are always told that the earlier you start investing, the better it is for you. Still not sure how? Look at the table above. If you had stayed invested for 10 years, you would have Rs. 2.59 lakh. If the 10 per cent rise in NAV had carried on for a further 10 years, you would have Rs. 6.7 lakh. But had you stayed put only for the first five years, you would have only Rs. 1.61 lakh! You need to, therefore, always give time for your money to work. Don’t lose patience with your investments within the first few years and pull it all out. Of course, compounding is also greater when you invest higher sums at the outset. So if you had invested Rs. 2 lakh in the above example, by year 10, you would have Rs. 5.18 lakh. The Rs. 1 lakh differential in the investment amount reaps a difference of Rs. 2.59 lakh in return. In a nutshell, the longer the period, the more the effect of compounding . Also, greater the investment amount, the more the effect of compounding. As Albert Einstein put it, compounding is the eighth wonder of the world.